When Jessica Duckett is not busy working behind the bar at Accrington Masonic Hall quenching the thirsts of masons. She spends her time working equally as hard by supporting a local charity called Motiv8-Lancashire. 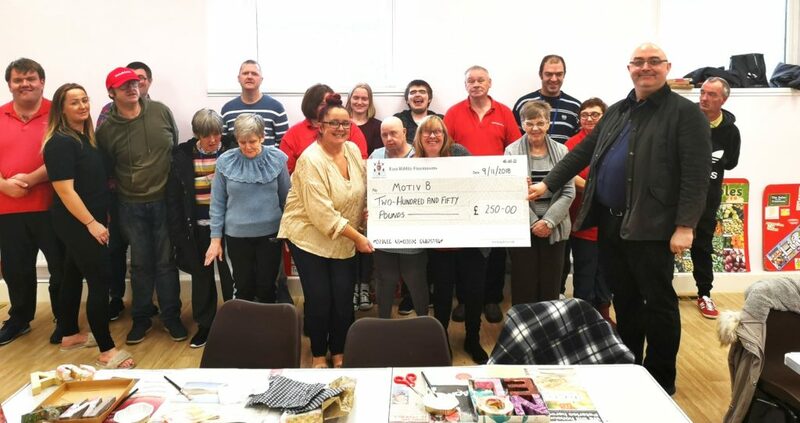 Motiv8-Lancashire provide educational learning activities for adults with a learning/physical disabilities, and for people with a mental health need or for people who are socially isolated. They deliver topics that include: Gardening, Information Computer Studies, Healthy Eating/Cooking, Multi-sports, Dance and fitness and a wide range of Art and Craft activities. The participants in these activities develop their social, functional and interpersonal skills and to gain in confidence by learning to work and communicate together and to share their ideas. Motiv8-Lancashire are planning a residential break at a waterpark at Coniston in the Lake District to canoe, sail and to go on walking expeditions. To assist Motiv8-Lancashire’s next adventure Jessica spoke with the Mike Stubbs who having gained the support of the District Charity Stewards presented a cheque for £250 to fund the transport for their getaway in the lakes.